Pets are a great addition to any home, especially those with the landscape to support them. Many a dog has enjoyed a yard to run around in, and many a cat has enjoyed a garden to prowl. You care a lot about your pets, so it’s important to not be careless when it comes to your landscaping. When looking at improving your outdoor space, either DIY or with the help of a contractor, it’s important to prevent your pets coming into contact with things that are hazardous to their wellbeing. This article will look at two of the most common causes of pet harm on your property: chemicals and plants used for landscaping. We all want healthy gardens and lawns, but many chemical shortcuts have unintended consequences for pets, especially small ones. Often to replace “size-fits-all” chemicals, you’ll have to turn to more specialized alternatives to kill weeds and pests. Check out our other blog, Chemical-Free Yard Care, for more details. Fertilizers: Many heavy-duty fertilizers may supercharge plant growth, but they contain chemical compounds in high enough concentration to be harmful to pets. Look for pet-friendly fertilizers or use alternatives like composts and mulches. Pesticides: A catch-all term for solutions that kill insects and weeds, the most popular pesticides are also harmful to people and their pets. Look for alternatives like Bacillus thuringiensis (Bt) that can kill many insects but leave you and your pets safe. We often pick plants based solely on their appearance – pretty flowers, large leaves, good groundcover – without checking to see if they are poisonous to our pets. And there are a lot, especially plants which are imported or have poisonous parts as a defense mechanism. The ASPCA has a complete database to check against here, but we picked 5 of the top used plants that are harmful to pets. 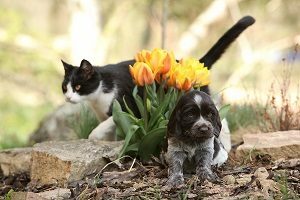 Crocuses: Spring and autumn crocuses are both harmful to pets. While the spring plant only causes vomiting and diarrhea to pets, autumn crocuses can cause toxic shock with internal bleeding, organ damage, and respiratory failure. Oleander: This is a very pretty outdoor shrub, but also very toxic – and not just to pets. If the flowers or leaves are ingested, it can cause severe vomiting, heart rate issues, and even death. Daffodils: While the flowers can induce vomiting, eating the stem and bulb of the plant can cause vomiting, diarrhea, abdominal distress, and even issues with the heart and breathing. Tulips: While the leaves and flowers will only cause irritation to the mouth, consumption of the bulb can lead to vomiting, diarrhea, and even changes to heart rate and respiration. Lilies: There are many types of lilies, but true lilies such as the Asiatic, Day, Easter, and Tiger lily are highly toxic to cats, with even a few petals leading to kidney damage and failure. To help avoid your pets digging up your gardens and potentially getting sick, think about getting some landscaping done to create a pet-friendly landscape. This can include simple things like raised flowerbeds and fenced-in gardens to keep your pets out, to creating places for your pet to relax, drink from, and even dig in without coming into contact with anything hazardous. Check out our blog, Improving Your Pets’ Lives Through Landscaping, for more details. Need a hand making a perfect landscape for your pets, and avoiding chemicals and plantings that could be hazardous to your pets? We can help you design the perfect landscape for your pets, as well as your budget and square-footage. Contact the landscaping experts at Greener Horizon today to get started.